The ULTIMATE Single Station Bungee for facilities! There is something special about bungee trampolines that kids just love. After all, who doesn’t want to jump like a super hero and do flips in the air? 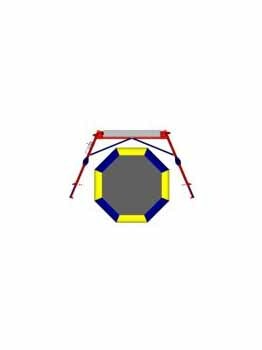 That feeling of freedom and excitement has made the bungee trampoline a staple in fun centers around the world. Our Single Station unit delivers the thrills, and can be paired with our other attractions to create a complete adventure zone. The Single Station Ultimate Bungee is powered by our proprietary Auto-Bungee system. This hydraulic system replaces the electric winch found on traditional models. A simple push/pull button is connected to the jump station. Pull the button out, and the participant is automatically pulled upwards as they jump. The operator is free to help another participant with a harness, or check on another station. When it is time to lower the jumper, simply push in the button and watch as they are slowly and automatically lowered. It’s as simply as that. Nothing beats the jumping experience that real bungee cords and trampolines produce! Countless alternatives have been tested, but everyone comes back to this gold standard. We use 3 bungee sizes to ensure each jumper gets the perfect bounce for their weight. Your choice of sealed air bongo or classic trampoline gives jumpers the bounce that they need. Our SS Ultimate Bungee is equipped with the very best components. Every harness, carabineer, bungee, pulley, and jump pod has been carefully selected to ensure that this is the ultimate jumping experience.